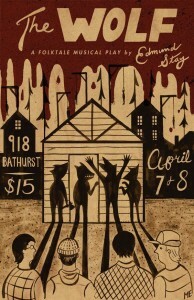 This past Saturday night, I visited The Handlebar in Kensington Market for the first time to hear my friend Edmund Stay rock-opera-out as he reprised the songs from his musical The Wolf, which debuted in the spring. I missed the full show back in April so this concert was my first chance to hear the band. It was fantastically dynamic and unique – if you could mix the harmonies of Arcade Fire, the grit of Bob Dylan, the mandolins and banjos of funky folk bands, and a soulful growl all up in a blender, you’d just be getting started on some genre definition. Throw in the plot – a village is being infiltrated by werewolves – and suddenly you’ve got to make room for wild stage screams. What. A. Party. Unfortunately there’s no recording (yet!). I won’t let myself miss the show when they put it on again next year, nor should you. Keep your eyes on The Wolf Folktale’s twitter for news on about upcoming dates. It’ll be worth your while. Trust me, I’m a doctor food swapper. What does a folktale musical have to do with swapping preserves? Well, they are two of the innovative events that pop up on the social calendar at The Handlebar (which opened in August). 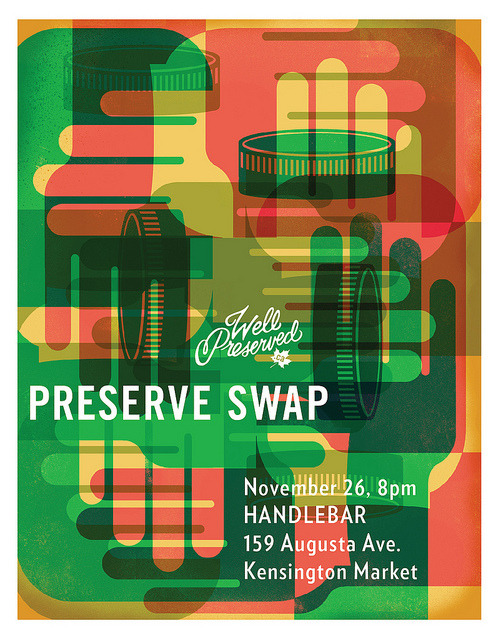 It was during the show that I happened to see this spiffy poster for an upcoming Preserve Swap to be held next week. The bar is a versatile venue. It has a strong aesthetic of its own with bronzed bikes hanging on the walls like lifeboats – in my mental utopia, I imagine it as a tip of the hat to The Boat across the street. However, Handlebar is also quite long and roomy, so it is an non-intimidating space to have all kinds of people mingle or keep to themselves. The Preserve Swap is the brainchild of Well Preserved, a social dining project similar to our vision for Divide & Savour. Dana Harrison, a designer, and Joel MacCharles, a foodie visionary, are the duo behind the blog. Read more about Well Preserved. They also use the blog as a platform for running their Home Ec series of events. This swap will be their third event. The swap is on Monday November 26th, with set-up starting at 7p.m. Participants will be able to mingle for an hour or so to scope out the goods on offer, and then the swapping and bartering will kick off at 9p.m.! They welcome all types of preserves, from jams and vinegars to dehydrated goods and bacon. Learn more about their swapping style and their past events at their Preserve Swap page. I suggest you check out their other Home Ec social dining events too! The swap is also open to visitors who have nothing to swap but are simply interested in checking out the scene. So there’s no excuse to stay at home! On Friday November 23rd, The Handlebar is hosting Derailed, a fundraiser dance party for Bikechain, the bike education and repair facility at the University of Toronto. Thanks for the updates about all the cool things happening in your end of the woods. I love your description on the music – well blended!